New Delhi April 17 (IANS) It would soon be possible to travel between Delhi and Mumbai in just 11-12 hours as the two metro cities would be connected through an expressway Union Road Transport and Highways Minister Nitin Gadkari said on Tuesday. 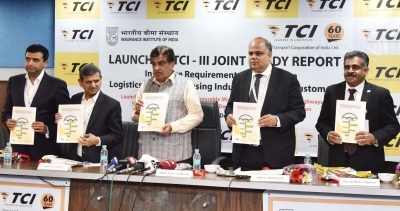 The expressway built at a cost of around Rs 1 lakh crore will be completely access controlled and would significantly reduce travel time between the two cities he said during the launch of a joint study report on "Insurance requirements of the Indian logistics and warehousing industry and their customers". Gadkari said through a new highway alignment between Delhi and Mumbai the government would bring down the land acquisition cost from Rs 7 crore per hectare to Rs 70-80 lakh per hectare. The Minister said while India is one of the fastest growing economies in the world the logistics costs were quite high compared to other countries. "As our economy grows we need to increase our exports which would be very difficult without bringing down our logistics cost." He said compared to trucks travelling an average 800 km per day in the US in India they travelled only 200-250 km. "I assure you that next year we will make sure that trucks are able to travel an average of 400 km per day " he said.